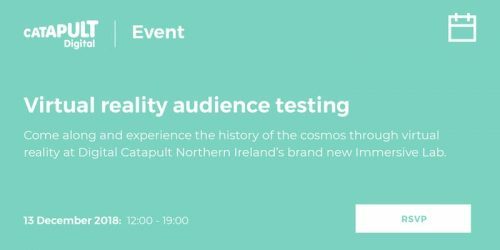 Digital Catapult is hosting a Virtual Reality Audience Testing event at the Immersive Lab in Ormeau Baths on Thursday 13th December at 12pm. Come experience the history of the cosmos through virtual reality at Digital Catapult’s brand new immersive lab. After experiencing the 8 minute piece, you will be asked to fill out an five minute questionnaire. Please sign up via Eventbrite here. For every 15mins, 3 individuals will have the opportunity to test the VR technology. Please ensure to arrive on time for your slot. Digital Catapult is the UK’s leading advanced digital technology innovation Centre, driving early adoption of technologies to make UK businesses more competitive and productive and grow the country’s economy. Digital Catapult connects large established companies, startup and scaleup businesses and researchers to discover new ways to solve big challenges in the manufacturing and creative industries. Through this collaboration businesses are supported to develop the right technologies to solve problems, increase productivity and open up new markets faster.